Humanity has read, hoarded, discarded and demanded books for centuries; for centuries books have been intimately woven into our sense of ourselves, into the means by which we find out who we are and who we want to be. They have never been mere physical objects–paper pages of a certain size and weight printed with text and sometimes images, bound together on the left–never just cherished or reviled reminders of school-day torments, or mementos treasured as expressions of bourgeois achievement, or icons of aristocratic culture. They have been all these things and more. They have been instruments of enlightenment. Once the invention of movable type and various commercial advances in the early modern era enabled printers to sell books to anyone who could and would pay for them (no longer reserving them for priests and kings), they became irresistibly popular: their relatively sturdy bindings gave them some permanence; the small-format ones were portable and could be read anywhere; and they transmitted sensory pleasures to eye, hand and brain. Children learned to read with them; adolescents used them, sometimes furtively, to discover the secrets of grown-up life; adults loved them for the pleasure, learning and joy they conveyed. Books have had a kind of spooky power, embedded as they are in the very structures of learning, commerce and culture by which we have absorbed, stored and transmitted information, opinion, art and wisdom. No wonder, then, that the book business, although a very small part of the American economy, has attracted disproportionate attention. But does it still merit this attention? Do books still have their power? Over the past twenty years, as we’ve thrown ourselves eagerly into a joy ride on the Information Superhighway, we’ve been learning to read, and been reading, differently; and books aren’t necessarily where we start or end our education. The unprofitable chaos of the book business today indicates, among other things, that slow, almost invisible transformations as well as rapid helter-skelter ones have wrecked old reading habits (bad and good) and created new ones (ditto). In the cacophony of modern American commerce, we hear incoherent squeals of dying life-forms along with the triumphant braying and twittering of new human expression. People in the book business, like the readers they seek out (a minute fraction of the literate population), hate to think that books might be moribund, and signs of vigorous life in some quarters belie the grim 2009 forecasts. Also, publishers have always mournfully predicted that the end was nigh–they must share either a melancholy temperament or sensitivity to the fragility of culture–so today’s dire predictions aren’t in themselves news. (I’m speaking here not of technical books or textbooks, which are facing their own crises, but of what are called general trade books–literature, politics, history, biography and memoir, science, poetry, art–written for the general public.) When I first got a publishing job almost half a century ago, my elders and betters in the trade regularly worried about The Future of Books, even though manuscripts continued to pour onto our desks. They worried, too, when firms changed ownership. The eponymous boss of the house where I first typed rejection letters and checked proofs sold his company to Encyclopedia Britannica in 1966; The Viking Press, which I joined in 1968, was sold by Thomas Guinzburg, son of its founder, to Pearson in 1975 and went through many permutations of a merger with Penguin Books, also owned by Pearson; Alfred A. Knopf, where I worked from 1987 to 1992, was a jewel of a firm that in 1960 had become a dépendance of Random House, in turn owned by RCA, then sold to the Newhouse brothers in 1980 and sold by them to Bertelsmann in 1998; Farrar, Straus and Giroux, which I joined in 1993, lost some of its independence when Roger Straus sold the company to Holtzbrinck in 1994, and more after his death in 2004. All told, I’ve worked in only four firms, yet for seven different owners and in eight or nine different publishing arrangements designed and redesigned to accommodate varying corporate intentions. I have seen up close how feckless management activity can change things. Of course, now we all are acquainted with truly vast corporate fecklessness, which has brought us a world-historical economic meltdown that dwarfs everything. For publishers, it comes on top of systemic difficulties they have long struggled to resolve, mitigate or ignore–difficulties only compounded by changes that the digital realm has been making in our reading culture. As we know, all retail businesses collapsed in September, failed to recover during the Christmas season and have been weak ever since. Book sales continued to drop in the spring, but then, they’ve been stagnant for years. It was in 2001, when the dot-com bubble was beginning to burst but before the shock of 9/11, that I first heard a morose sales director use the catch-phrase “flat is the new up.” Book publishers and sellers were overextended and had grown careless, like everyone else, in the go-go years, while the digital reading revolution continued and business worsened. In the past six months, layoffs and shutterings have become commonplace. A key element in the dissemination of books, independent of publishers and booksellers but essential to both, is the press. The simultaneous collapse of the business model for newspapers and magazines is a gruesome fact of life, and we book people keenly feel the pain of a sister print-on-paper industry, to put it mildly. All citizens should be alarmed by the loss of such a vital necessity to a democracy. But the hard numbers and socioeconomic exigencies of journalism’s huge crisis differ greatly from those of book publishing’s smaller one (though they are often conflated). Here I want only to stress that the loss of so many book-review pages nationwide is crippling all aspects of our literary life. And I mean all. Book news and criticism were fundamental to the old model of book publishing and to the education of writers; Internet coverage of books, much of it witty and interesting, does not begin to compensate for their loss. It is taking time for the obsolescence and decay in the book world to show, given the energy and talent of so many writers, their continued devotion to book genres, the resourceful bravery of some publishers, the continuing plausibility of many aspects of their business, the pleasure and profit taken in reinforcing familiar reading habits and the astonishing biodiversity of book publishing. Not to mention the usual quotient of laziness. European publishers are happy right now because things seemed to go well at the winter book fairs in Leipzig and Paris; the London Book Fair, in April, was hopeful if meager, with strenuous, incoherent efforts made to engage with the digitized word. In America, pubescent vampire novels are selling like crazy to readers of all ages, also memoirs about cats and puppies; classics are still in demand, as are cookbooks about cupcakes, of which there are an amazing number. Books by brand-name writers continue to populate the bestseller lists (though not racking up the numbers they used to). Every week the trade bulletins report hundreds of new books being signed up, sometimes for absurd amounts of money, by dozens of publishers. Self-indulgent excess doesn’t go away, then. This exorbitance in the book sector, as in the gigantic financial and housing sectors, has been weakening our culture for decades. Hubristic, ill-considered follies reached notable highs under the Great Deregulator, President Reagan, but to be fair, book publishers then (many still carrying the names of the confident men who had founded them twenty-five, fifty, 100 or 150 years before) were panicking, for they were losing their once dependable base, and Reagan made things worse by cutting federal funding for libraries and other appropriations that had helped to fuel America’s postwar advances in literacy and book-based education. Americans were fleeing both small rural towns, with their once respected libraries, and big cities, with their many bookstores stocking a full range of titles; they were heading for suburbs and exurbs where bookshops were few and scattered customers hard to reach. We haven’t recovered from this, though we’ve finally realized the dark consequences of our hectic expansion into socially vacuous space–much of it now underwater, as we’ve learned to say. Simultaneously, Wall Street and Big Media–RCA, Gulf & Western, Bertelsmann, Pearson, Maxwell, Newhouse, Murdoch–moved in on the beleaguered publishers. The dismal consequences of this infamous development are often bewailed, but we ought to be clear about the characteristics of book publishing that were supposed to survive this assault and maybe could have. The idea had been to produce and distribute profitably as many books as a company’s staff could prepare for publication in a given season, keeping a well-trained eye on paper, printing and binding costs, using skill, nerve and detailed local knowledge about the likely readership to arrive at what one hoped was the right print run, price and release date. One could never be sure if you’d gotten these last three right, but at least the trade developed means either to scupper overstock or reprint quickly books that were selling faster than expected; as to price and release date, you did the best you could and held your breath. One mark of a publisher’s quality was how well he made these guesses. But the chief marks were in the choices he made among the materials submitted to his company; the editorial and advocacy work his staff did on behalf of the nascent books, building an audience for them, preparing the ground; the copy-editing, proofreading and legal checks; the typographical designs devised and manufacturing quality achieved; the efforts made to get attention paid to, and sales consummated of, books that might otherwise go unnoticed in the noisy, trivializing, inattentive world where readers live. For centuries, these activities were the publisher’s principal raisons d’être, and they affected the substance, size, even quality and intention of tens of thousands of books big and small, the work of writers talented and untalented, now famous and now forgotten. Publishers and writers have for centuries conspired and fought over words, sentences, chapters, fonts, illustrations, paper, trim size, binding materials, jacket design. Publishing decisions made distinctive differences to literature in every century. A publishing rationale lay behind Descartes’s wish that Discours de la méthode have an unusually small format. The publisher of The Charterhouse of Parma wanted to issue it quickly and needed it shorter; Stendhal concurred–hence the rushed compression of its ending (a flaw the consummate professional Balzac noticed). G.B. Shaw insisted on a specific typeface (“I’ll stick with Caslon until I die,” he said, Caslon being the font Ben Franklin also used for setting the Declaration of Independence); Edmund Wilson on an unusual trim size; John Updike on all physical aspects of his books. If you speak of the death of books, you are speaking of the extinction of this shared culture of choice, correction, revision and presentation, along with its craft skills. If you talk of the future of books, you must somehow anticipate how it might continue. As the megapublishers tightened their grip in the 1980s, I was dismayed to see a number of once good firms of markedly different publishing style or literary taste make foolish, overpriced mistakes; they seemed to be losing their bearings as they paid ever more money for ever more questionable properties, entrusting the sewing up of these sow’s ears to not very experienced practitioners. I asked Jeremiah Kaplan, founder of the Free Press, a once autonomous and brilliant publisher of serious social science, how things could go so wrong. Besides the obvious motive of greed, he thought it simple. “Businessmen never learn from their mistakes because they always find someone else to blame for them,” he said. “Businessmen only learn from their successes. Except publishers can’t do that.” He smiled. We both knew well that you couldn’t foreordain a bestseller, no matter how wisely you handled every detail. And the necessary skills were disappearing. “Since our successes can’t be replicated, publishers learn nothing! Nothing!” Roger Straus, too, a skillful practitioner if ever there was one, understood the chanciness: “Aw, a blind pig can find a truffle,” he’d say, deflecting praise for publishing a good book well. Yes, a lot of it was blind luck. Publishers used to presume that money earned on successful titles would help pay the bills incurred in producing and marketing books that sold less well but that they supported for reasons of cultural pride, literary respect, political conviction, competitive zeal or quirky enthusiasm. And they depended on what had been an extensive network of independent booksellers who also cared about these works, carrying the “frontlist” of new titles and goodly portions of the “backlist,” books from years earlier that continued to attract readers, albeit in smaller numbers (this “long tail” was the book trade’s most profitable sector). America’s best independent bookshops–those founded in the 1970s, like Powell’s, in Portland, Oregon; Tattered Cover, in Denver; Square Books, in Oxford, Mississippi; Brazos Bookstore, in Houston; Elliott Bay Books, in Seattle; and older landmark ones–prospered because they stocked their copious shelves with backlist titles for students, browsers and enthusiasts, and tailored their frontlist choices to their customers’ tastes, interests, even anxieties. (And they didn’t condescend. I’ve encountered condescension in the book trade only among schlock purveyors, who like to emphasize how low their customers’ tastes are, how limited their curiosity.) Writers took this infrastructure for granted, if they thought about it at all. 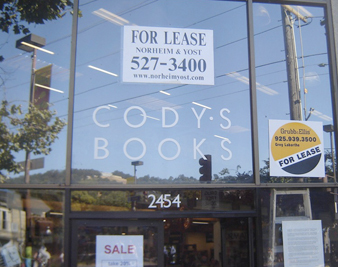 That bookselling and publishing were small operations, as American businesses go, suited the shared enterprise; word of books spread virally from one locale to the next, one reading group to the next, one conversation to another among editors, sales reps, booksellers, customers–all of them benefiting from local or national reviews, well-publicized author appearances and lots of reading. Knopf and his competitors made their remorseless calculations in order to keep their enterprises afloat during those bad years. Indeed it’s only recently that publishers have reconsidered the formulas worked out then for budgeting, pricing and discounting books. You’d think that paper or printing costs might not represent the same fractions of a book’s cover price as they did in 1939, say. And what about composition costs, now that authors submit their work in computer files, eliminating the need for typesetting? (When this issue first arose, publishers refused to acknowledge that the writers were defraying a good part of the manufacturing costs, declined to raise their royalty percentages and claimed instead that a due increase in income would arrive thanks to more sales resulting from lower cover prices. The arithmetic remained unchanged–even though the clueless MBAs who swarmed into the business in the 1990s might have spiffed things up. Of the roughly $10 a publisher took in on a $20 book, say, 10 to 15 percent of the cover price was allocated to the author, leaving only the remaining $7.50 or so to cover the fixed, make-ready costs (coding, proofing and correcting the author’s original disk, press preparation and such); the varying paper, printing and binding costs; the cost of sales and marketing; the overhead; and maybe some profit, 4 to 5 percent if all went well. No wonder they longed for bestsellers, the income from which would allow expansion of staff, or staff salaries, or the size of the list–or profits. Along with old-time skills, the trade publishers risked losing their nerve and cultural daring. This is a well-known sad story. The money men trusted editors less and marketing people more; literary experiment was frowned on, though gambling on popular authors was acceptable–and they all bid to publish the same ones. They became more and more alike, competing to overpay for the same celebrities. Mercifully this was not uniformly true throughout the business. Small presses and still-independent houses with unimpeachable professional standards continued their exploratory, lively work, and university presses continued, even increased, their commitment to innovative books in the sciences and humanities; they became home to scholars who decades earlier would have been “discovered” by a Harper, Knopf or Macmillan–as William James, Keynes, Veblen, Gould, Arendt, Schlesinger, Hofstadter, Foucault and countless others had been. Today the trade houses may grab already world-famous professors or ambitious younger professors whom agents press on them, but they rarely find eggheads on their own. The corporations that consolidated the publishing houses, like the Silicon Valley children of today, saw book copyrights as valuable “content” with plenty of cultural cachet that could be “synergistically” exploited–optimally by the other arms of their media empires. The publishers didn’t mind this, since they had long depended on the sale not just of original editions but of subsidiary rights–mass-market paperback and book-club editions; foreign, film and TV rights; magazine or newspaper serialization. The new corporate arrangements seemed likely to augment these juicy opportunities. That the money men found publishing’s profit margins absurdly narrow and insisted on at least a 15 percent return on their investment seemed harsh but practicable. That they had no confidence in books per se and knew nothing about writers or readers seemed a neutral factor, not the harshly negative one it actually is. As any sensible businessperson knows, you can’t make money in a low-profit operation unless you stay close to your sources of supply and demand–writers and readers in this case. And it helps your profit margin to love or at least respect them. Another unacknowledged danger was the new twist given to familiar vulgarity. We knew about opportunistic books by or about politicians and celebrities–these had been hardy perennials for centuries. We knew about movie and television tie-in sales (they started in the 1930s and ’60s, respectively, with Steinbeck and Galsworthy, for example); tens of thousands of new readers devoured the novels on which big- and small-screen hits were based. This wasn’t high or low business, just good-sense middle. But by the 1990s, with the people in charge taking their cues from Hollywood and worshiping at the altar of television and the Internet, a tipping point was reached and passed: many bestsellers were now going in the opposite direction. More and more derivative pseudobooks were spun off from the Internet or TV, booklike objects created by the teams working for, say, famous generals in televised wars, cooks, telly dons, ballplayers, reality-show contestants, famous pets. These flashy items dominate shelf space, ad budgets and public attention; they leave nowhere near enough air, space or money for true literature. The late Robert Giroux used to say dismissively of such volumes that they were “almost books; let’s call them ‘ooks,” but like invasive shrubs in a once well-maintained garden, they are choking off the life-support systems for vital literature. The stifling excess of lucrative junk is, naturally, galling for literary artists unknown or only slightly known to the mass market, whose talents are perhaps not suited to it; they want or need the filthy lucre too. Their ever more powerful agents have successfully decoupled the size of the royalty advances they receive from any estimate of the books’ eventual earnings, and routinely assure them that if Knopf or Norton or Morrow fails to earn back the upfront money, it’s because their masterpieces were badly published, not because the advances were implausibly high. This is cheering, of course; writers’ egos are always shaky, and they tend to forget the sage warning that you should disregard compliments extended by someone whose income derives from your own. Also, they won’t acknowledge that literary quality may decline as advances increase; only rarely is a writer liberated into confidence-inspiring freedom by following advice from greedy publishers about Pleasing the Crowd. Willa Cather wasn’t the only fine writer who refused advances for being, in her view, unethical, nor was D.H. Lawrence the only one who found them demeaning. The agents have much to answer for. What now? Publishers are battening down, and chain stores are struggling, having staked so much on nationally merchandised dreck, having committed themselves to imitating the look of the big indies but never quite matching their tighter local focus and skill in “hand selling” genuine books to readers. Anyway, the entire world of American retail business is veering toward obsolescence. Must books now find their way in cyberspace? This prospect is even more alarming than the crisis threatening brick-and-mortar stores, for the World Wide Web is an ocean with few buoys to mark navigable channels of meaning. The channels we navigate on it are mercantile channels, designed to be lucrative–but not for us. The omnipresent money-grubbing–far removed from the pure, open-access Eden that the Internet’s founders claimed they wanted–may seem natural to Americans used to wearing corporate names on their clothing and seeing their public spaces defaced with company logos and ad slogans, but the habitat is unnatural for the true life of the mind, politics or art. In this dystopia, one can scarcely get attention paid to new books except those that fit in with the flora and fauna already found there. True, you can easily reach niche audiences and specialty communities for your oh-so-unique book, but what of the general culture? How is your book being read? And in what manner might you try–say, ten years from now–to write something new? How will you know if it’s any good? How will it become known? Will it be a book? Like everyone else, I couldn’t be more grateful for the stupendous riches that great search engines find for me on the web. Like everyone else, I’m now accustomed to the speed and ease with which I can locate “content.” No argument there. But my reading on the web is of a completely different order from my reading of or in a book, and it would be even more so if I hadn’t already put in decades of bookish exertion. If I’d done my schoolwork on a computer, if I’d grown up text-messaging and Twittering, I’d not only listen and read differently, but I’d think and express myself differently. It’s no surprise that teachers and writing instructors report big changes in their students’ habits of attention and modes of expression. No surprise. We’ve always known that technologies new and old affect our inner imaginative understanding of the world. This is why we must still ask, of the possibilities that “books” could be offered in other formats or sold in new ways (once we’ve developed reliable income streams from writing and selling them), what kind of imaginative energy, what kind of reading–or readers–will Scribd, Kindle, Sony Reader or other electronic devices attract in the years to come? And what kind of writing? It’s a colossal irony to have the guys and gals of Amazon, Google and their ilk lusting for free book “content” as premium material on which to stake their enlarged claims to commercial riches. For these clever mathematicians and engineers who are shaping the electronic business of our time and the archives of the future, these baby-faced young entrepreneurs, have risen to their mercantile eminence without encountering books, and don’t think they need to. I enjoyed the fatuous surprise of Google’s Sergey Brin discovering that “There is fantastic information in books. Often when I do a search, what is in a book is miles ahead of what I find on a Web site.” Translating this backhanded recognition of value into his own debased lingo, he understands that books make for “viable information-retrieval systems,” information being the only cultural signifier he recognizes, evidently. His company’s amazing presumption that book people should simply hand over the keys to their priceless kingdom shows how completely he and his colleagues misunderstand what is at stake. But these Internet people don’t care. For billionaires like Brin, accessing the giant river of infinite book “content” onto which they can glue paid advertising is simply a giant new way to make more money, and they are single-minded about that. The giveaway is not only in their ignorance but in their reluctance to share the wealth. For its Look Inside program, Amazon demands that publishers give it, gratis, electronic files of the books, along with blurbs and cover art, arguing that in return the publishers will have increased sales. How might you prove or disprove that? (Publishers might recognize Amazon’s argument, since it resembles the pathetically phony one about composition costs that they themselves used against writers years ago.) The (not yet settled) settlement between Google Book Search and the publishers who sued it for copyright infringement proposes to give a breathtakingly audacious near-monopoly to Google and mingy terms to writers. We publishers seem to have forgotten that Google’s and Amazon’s profit margins are triple or quintuple ours, and we haven’t always checked our contracts with the authors.